From it’s premier in 1975, when it changed the face of late night television, to today, Saturday Night Live has continued to innovate and delight, continually pushing boundaries along the way. It launched the careers of some of America’s most beloved comedians, and for four decades has kept its audience’s attention with smart satire and hilarity. Originally published in 2002, Live from New York: An Uncensored History of Saturday Night Live documents the history of this iconic show, not through the eyes of an outsider, but through the stories of the performers, writers, guest hosts, and many others who worked to bring SNL to life. These uncensored accounts give the reader insider-only glimpses into the show’s workings both onstage and off. No subject is left untouched, no matter how personal or controversial. 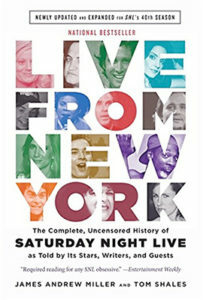 In 2015, Live From New York was re-released, just in time for SNL’s 40th anniversary, complete with 100 new pages featuring candid accounts from stars of the past decade. This oral account includes interviews with legendary stars such as Bill Murray, Dan Akroyd, and Steve Martin as well stories from more recent audience favorites like Tina Fey and Jimmy Fallon, each telling the history of this beloved program in their own words. The expanded, updated edition of Live From New York was released on 10/6/2015 by Back Bay Books. Find it at your local bookstore or order your copy online today.